Hey! Here is something cool. 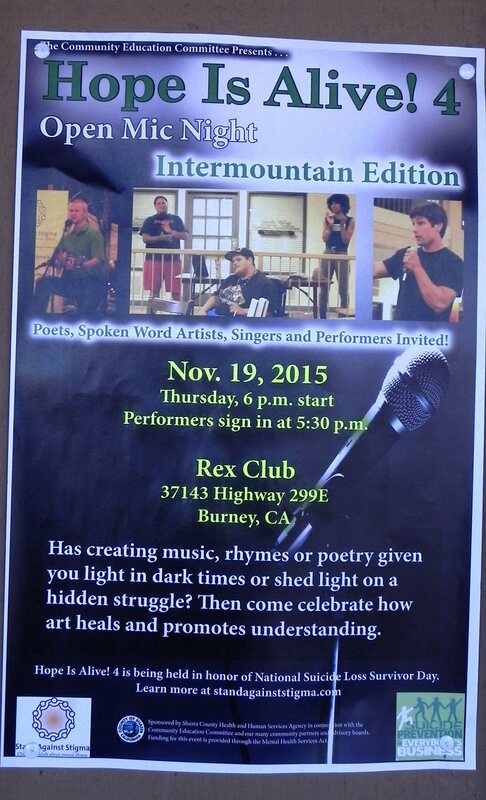 When Linda got home she showed me a flyer that there will be an open mic night on Thursday, November 19 at the Rex Club at 6 p.m. Poets, spoken word artists, singers, and performers are invited to come and share their talents. Those who wish to perform should come to sign up at 5:30. This is a free event being held in honor of National Suicide Loss Survivor Day on Nov. 21. It is being sponsored by Shasta County Health and Human Services Agency in conjunction with the Community Education Committee along with community partners and advisory boards. Funding for the event is provided through the Mental Health Services Act. This is a great opportunity for people to share their talent for a worthy cause. It’s also a wonderful occasion for people who don’t perform but enjoy listening to come together for a meaningful evening. I love poetry and music. I believe it is good to promote hope and healing. I plan on signing up. How about you? The event has a Facebook page.